Are you ready for fall? One of the easiest ways to update your wardrobe is with fabulous accessories. 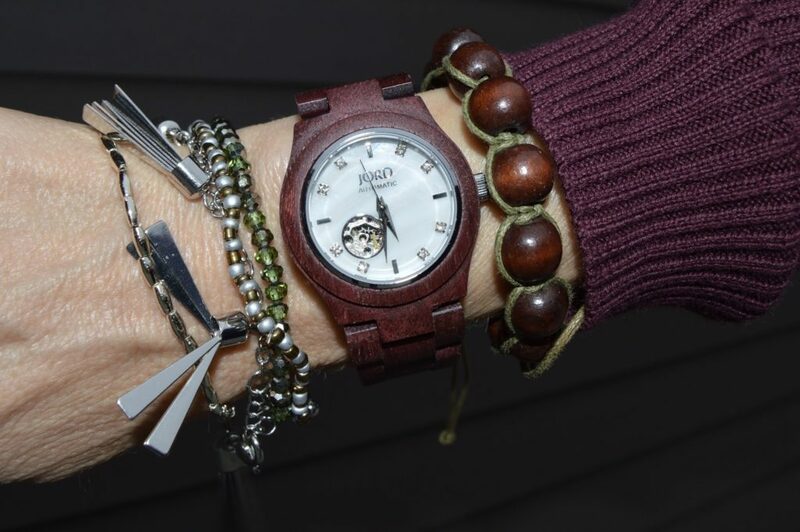 A Jord watch, made of deep rich wood, will add an extra element of chic to your fall arm candy. My fav of the moment is this Jord Cora Series in purpleheart and mother of pearl. Isn’t it gorgeous? For this outfit I started with basics, a plain black tank and jeans. Then I added fun accessories to make the look interesting. This fabulous long cardigan is from Foxcroft. I had planned to save it’s debut for another post, but it just looked so perfect with this fabulous watch that I had to wear it! and a bag with fringe! Ready for the best news? Enter to win a $100 e-gift card for JORD! All contestants will get a $20 e-gift card just for entering! And hey, more fun news: Let’s really get the party started on Instagram! Use the hashtag #fashionshouldbefun on any or all of your outfit posts on IG and each week I will pick one look to feature on my Instagram account, with a special shout out of course! Let’s keep the #instalove flowing in all directions! Now to last week’s favs …. 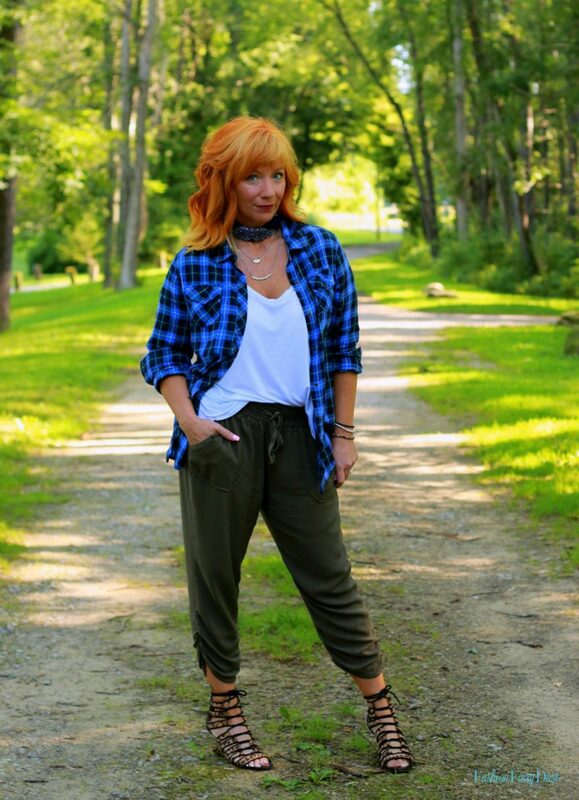 Debbie of Fashion Fairy Dust rocking the bandana trend! Alina of Alina Ermilova looks lovely in this mod-inspired dress. 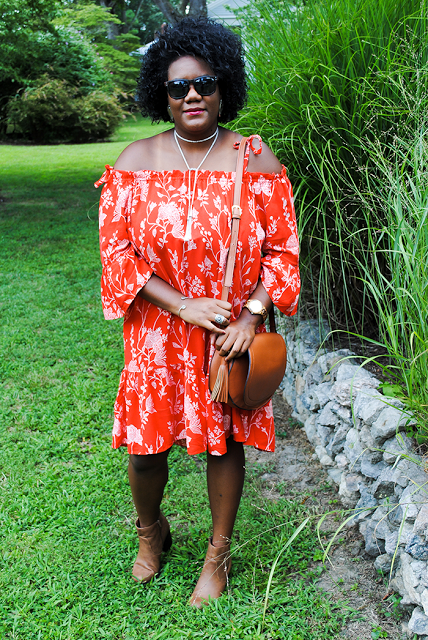 Amanda of Truly Yours, A is a vision in bright poppy orange! Link up, link back, have fun & be fabulous! Post sponsored by Jord. All opinions are my own as always. Cute outfit, love those booties!! Fabulous outfit! The watch is so pretty! It goes so well with the cardigan! And I love the boots! Oh, I am yearning for fall weather, Dawn Lucy! And now you have made my craving even worse in your fabulous rich purple duster and amazing booties! And I really need to get myself a Jord watch soon! I have been sitting on a $75 e-gift card for a month and I need to use it soon before it expires! I have the Jord purpleheart watch too and I love it! I'm also loving those fab boots! gorgeous watch! I love my JORD. Those boots are so cute!!! I love all of the fun accessories, especially the boots! I hope you have a great weekend! Those boots are such a great statement piece! You're absolutely right…that cardigan is perfect with the outfit! And the dark Jord Watch—marvelous!! Dawn, that's a stunning outfit and so perfect for fall. I'm covering those boots … I need more animal in my wardrobe. Oh I love your watch – I just recently got the same one, haha! It's really nice with the ribbed cardi. Loving this color combo, especially with those awesome boots. Great watch too! What a fun fall look! Love the booties! I love your accessories here! In particularly the booties, fabulous. This is such a stunning look! Love those booties! 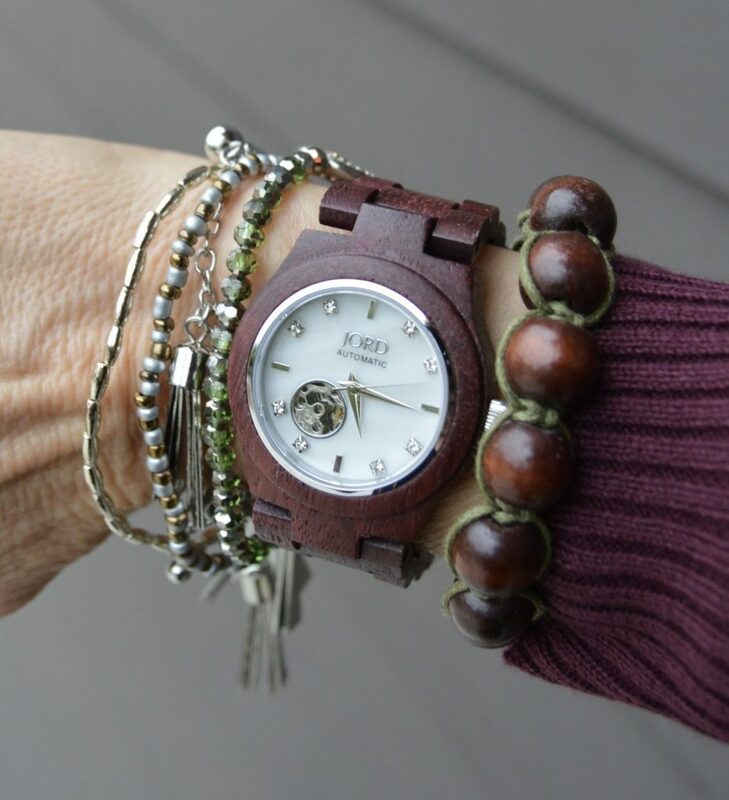 What a gorgeous watch and dying over this fall look! Those boots are amazing! I love JORD watches and so does my husband! Yours is so pretty for fall! Love the colors! Love your look today, Dawn! Thanks for the linkup! You are looking absolutely model-esque Dawn! Beautiful cardigan, the booties are to die for and the bag is fabulous. The watch and cardigan were meant to be together! And thank you so much for the shout out! Great fall outfit! I love the burgundy cardigan and watch! I just got the same JORD watch & so in love with it!! It looks great on you & this look is fall perfection! Have a great long weekend! Adore this outfit! Those boots are badass! The watch of course I love, its my favorite! I am absolutely loving this look!!! Those boots…. obsesses! I love the Cora and this one is just gorgeous! It is perfect with this duster cardigan. Your boots are just so funky and fun and a great way to complete this look. Those boots…FABULOUS! I love the whole look. You nailed it; fall without the fall weather…well done!